This article is part of the “Two Weeks in Japan” series and follows Two Weeks in Japan, Part 3: Kinosaki Onsen. This series of articles has been dragging but I need to make an effort and finish it, especially because I have had such a great feedback. Our original plans for Kinosaki Onsen were to go to the beach to the north of it but it was raining a lot and we decided instead to start the trip to Takayama but it was just too far away so we chose a point in the middle of the route to stay: Nagoya. I had read on our guide that Nagoya didn’t have much to see and it was right. We found a ryokan to stay by choosing one from the list we got at the tourist information office at Nagoya’s train station and calling them to check for the availability. This ryokan, which I cannot really remember the name (and I don’t have my notes here unfortunately) was a bit cheaper than the others but of course, it wasn’t half as good as the others. 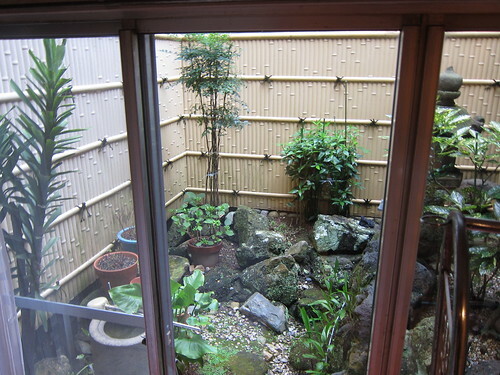 The room was big and with a Japanese garden in a patio but while it looked nice, the garden turned out to be composed of artificial plants and the tatamis, futan, etc. also didn’t have the same quality as the other ryokans we stayed at. The worst though, was the toilet. In the previous article I forgot to tell you how cool the toilet was in Morizuya ryokan. Yes, it was one of those high tech Japanese toilets. When I opened the door to the toilet’s cabinet, the toilet opened it lid automagically! 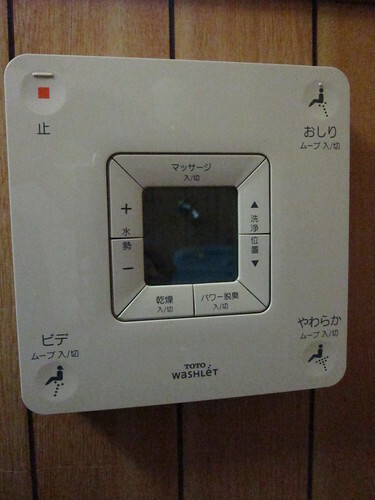 It also included a heated seat but there was no toilet paper… Instead, I had a control pad mounted in the wall next to it, illustrated with pictographs of what the buttons did. See, one doesn’t need toilet paper in Japan… think water jets. I can tell you that you’ll feel very fresh! In comparison, we’re in the dark ages of hygiene here in the West. I could go on about how I think they got smart computer vision algorithms who can find the exact spot where to point the water jet but I’m not. Hit the right button and you’ll feel reborn! Anyway, this was not the case in Nagoya’s ryokan. You would think that with such advanced technology in fields for which innovation isn’t the first thing we think about, I expected the “beginner’s” level to be a regular, western toilet but it was in fact a squat one. I still tried to utilize it but my lazy, western body doesn’t have the balance required. Luckily there was a 7-Eleven around the corner with a regular toilet and very clean (as everything in Japan). During the evening we didn’t know what to see so we just took a walk until the Nagoya Noh Theater which has a nice samurai statue outside. 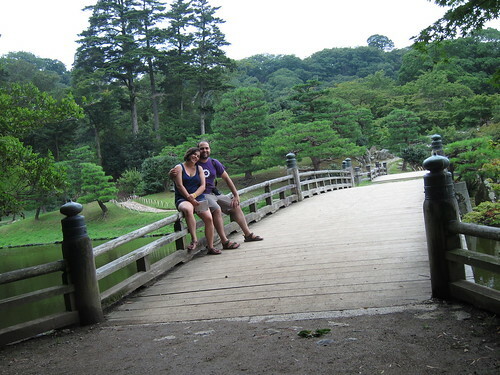 The next day, we headed to Takayama but we did a little detour to visit Hikone Castle. 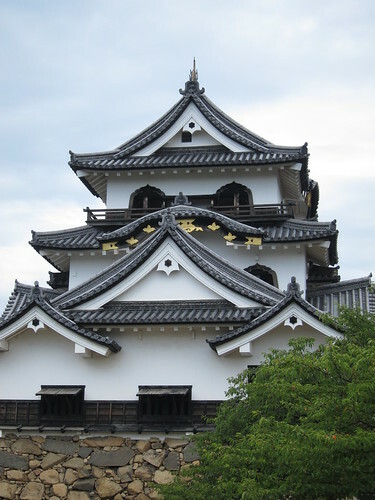 I love Japanese architecture so I wanted to visit a Japanese castle during our trip but we discarded the famous Himeji Castle because it is under restoration until 2014. 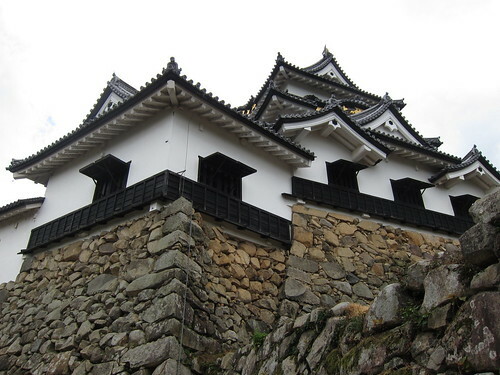 Hikone Castle was the alternative we chose, it was conveniently located on our way to Takayama. 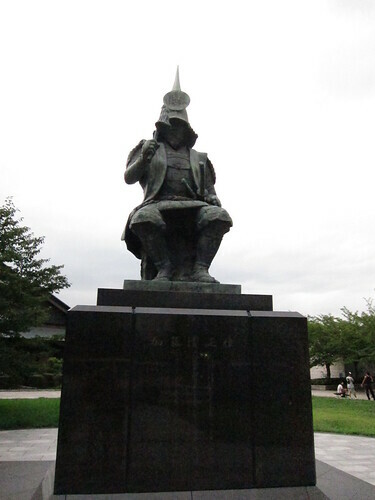 Hikone Castle is a small one but is one of the few which hasn’t been destroyed in any war or any other tragic events throughout history. I also kept thinking “I think I sneaked into this place in Tenchu“! Since our backpacks were very heavy, it was crazy hot&humid and there were too many steps to climb, we kindly asked for the tickets office to keep them, which they kindly did even though it couldn’t fit any of the lockers. Hikone Castle was very nice and quick to see but the ticket also gave access to the gardens behind the castle which were very beautiful and relaxing. 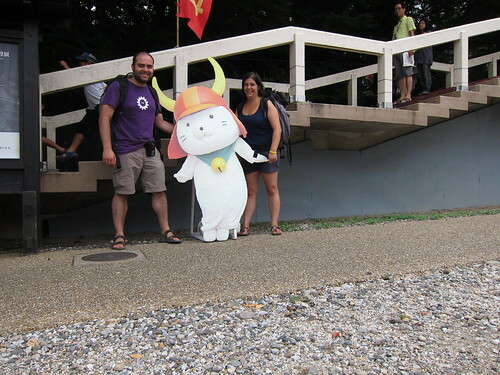 The town’s mascot is a cute samurai cat called Neko-nyan, be sure to take a picture with it if you go there. Neko-nyan loves taking pictures with Western tourists! After Hikone, we finally headed to Takayama, the Japanese Alps. I will hopefully not take that long to write about it so stay tuned and enjoy some more pics meanwhile!